Six popular Chinese films will be shown this week in New Zealand movie theaters amid efforts by both countries' governments to increase cultural exchanges. The films are "The Mermaid," "Xuan Zang," "The Monkey King 2," "Go Away Mr. Tumor," "Crouching Tiger, Hidden Dragon: Sword of Destiny" and "Monster Hunt." The screenings were announced on Tuesday during the 2016 New Zealand China Film Week. 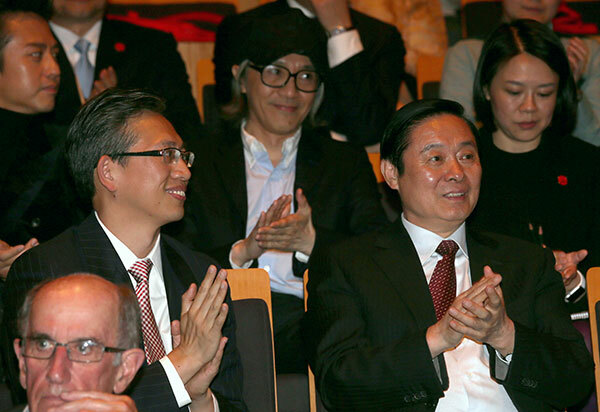 Liu Qibao, the Communist Party of China Central Committee's publicity chief, attended the opening ceremony in Wellington, the New Zealand capital. He is leading a delegation of senior cultural officials on a visit to the country from Tuesday to Thursday that is aimed at boosting cultural exchanges. Wang Lutong, the Chinese ambassador to New Zealand, said the country is the first to conclude intergovernmental film and television co-production agreements with China. In 2010, the two governments signed an agreement on film co-production. Many scenes of Crouching Tiger, Hidden Dragon: Sword of Destiny were shot in New Zealand. "As noted by President Xi Jinping, film and television co-production will inject new impetus into cultural exchanges," Wang said, adding that China's development has brought new opportunities to work with New Zealand. Zhou Jiandong, an official from the State Administration of Press, Publication, Radio, Film and Television, noted that The Mermaid, which was shown on Tuesday afternoon in Wellington, is China's highest grossing film ever, with box office revenue of 3.38 billion yuan ($516 million). "China has an ancient history with a marvelous civilization, while New Zealand has beautiful natural scenery, and the two countries have much potential to work together in shooting films," he said. Last year, China's box office receipts reached $6.8 billion, with a year-on-year increase of 48.7 percent. Stephen Chow, director of The Mermaid, said at the opening ceremony that he wanted to shoot a movie with scenes filmed in New Zealand, given the beautiful scenery there. Six popular Chinese films will be shown this week in New Zealand movie theaters amid efforts to increase cultural exchanges.